Blue-winged teal frequent both large waters and small, including lakes, sloughs, swamps, beaver ponds, farm ponds, strip mine pits, etc. They feed on aquatic vegetation and invertebrates in shallow areas, and they commonly rest and preen on mud flats bordering these shallows. The best way to find these birds is simply to go looking for them. A day or two before the season opens, head to likely spots at dawn to see what’s there. If teal are present, they’ll be visible, sometimes in large flights working over feeding areas. Also, understand that teal hunting can be a boom-or-bust proposition, and the outlook can change quickly. Blue-wings are cold-front-driven. Even the slightest north wind can bring in a new wave of birds. A swamp like the one Wright and I were hunting can be void of birds one day, then covered up the next. This is why we were in Wright’s blind the morning described above. On the day before opening morning of Kentucky’s 2006 season, a stiff (for September) cold front had blown through. We’d hunted these birds enough to anticipate what the next morning would bring. And obviously, we weren’t disappointed! All decoy manufacturers sell teal decoys, but they are usually painted in a winter (breeding) plumage pattern. However, in September, blue-wings are still in eclipse plumage, meaning their heads and bodies are all brown. 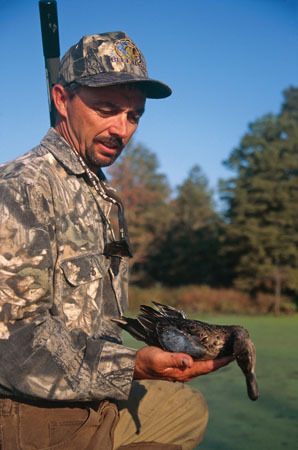 Also, most teal decoys are sized to match live birds — small. This means their profile is slighter, and they’re harder to see at long distances. For this reason I prefer to use standard mallard decoys with a preponderance of hens in the spread. The brown color is a better match for the season, and the larger-profile decoys are more visible. The number of decoys I use depends on my hunting location. On big water where trading ducks can see a long way, I may set out five dozen. But on smaller, more confined water (ponds, sloughs, etc. ), a dozen decoys might be plenty. Wright’s blind rules over a one-acre pothole in a thick swamp, and on the morning of our hunt I put out only 12 decoys in a random pattern. Or make that 13. The extra decoy was a Mojo wing-spinner, set on a pole in the middle of my spread. Teal are drawn to wing-spinners like magnets. Typically, they’re fresh off the prairies, and they haven’t been educated by hunter pressure. Hunters may or may not elect to use a wing-spinner decoy, depending on their personal preference (and current regulations.) But where early-migrating teal are concerned, a wing-spinner is a definite plus for drawing birds into close shotgun range. In September, vegetation is still lush in most flyways. And since teal aren’t too hunter-wise, most waterfowlers can get by hiding in whatever natural cover is available: willows, buck bushes, cattails, sawgrass, etc. It’s not that fixed blinds aren’t great —Wright and I enjoyed standing on a firm platform instead of in soft mud. But a patch of thick vegetation, supplemented by all-over camo clothing (including a face mask is usually sufficient to keep these birds from seeing you. That assumes you’re standing stock-still. Take along a hand axe or a machete for cutting brush on-site. Also, it’s nice to have a seat handy for periods of inaction. A five-gallon bucket turned upside down is perfect. (If a bucket is white or bright-colored, spray paint it in olive drab before the hunt.) Also, a dove stool will work if the mud is firm enough to keep its legs from miring up. Blue-wing hens make a call similar to a five-note hail call of a mallard hen, except it’s higher-pitched, faster and softer. Call companies sell calls that realistically mimic this sound. However, my experience is that standard, louder mallard calls are more effective at attracting these birds. It’s the same philosophy as using the mallard decoys. Mallard calls are louder and can be heard from farther distances. Also, teal and mallards frequently share the same waters, so there’s nothing unnatural about teal hearing — and responding to — mallard calls. Also, one twist to calling teal is “laughing them in,” which I’ve seen guides do at teal-rich Reelfoot Lake in west Tennessee. When a flight of teal is spotted, a guide will laugh aloud — ha, ha, ha, ha, ha — in a high-pitched voice and tempo similar to a real teal’s call. It sounds crazy, but the birds respond to it. Who cares what it sounds like if it works? Teal are the buzz bombs of the duck family. They fly fast and dart unpredictably, thus earning their reputations as some of the trickiest targets in wingshooting. However, they aren’t difficult to bring down. A couple of pellets on target will usually cause teal to splash. This is why teal hunters need shotguns that swing easily and throw dense patterns of fairly small shot. Lighter, shorter guns are better for this purpose, and chokes should be improved-cylinder or modified. Shot sizes should be No. 4 to No. 7 ½, of course in a non-toxic payload. One great choice for teal hunting would be a 20-gauge over/under, especially over smaller waters. Normal shooting distances will average 20 to 30 yards, and the 20-gauge will handle this chore neatly.